By the time you read this I will hopefully be heading west for a couple of college revisits. Yep. It's me, the boy, Princess Blue Kitty (my faithful car), and Jo-Jilly (my obnoxious less faithful GPS) on the road again! Today we have a Straight From The Editor for Wendy's winning pitch from February. Life is good for the insects at the campground—until something attracts a hungry bullfrog. When Herman, a feisty firefly, takes a sip the hiccuping winged beacon learns why he’s been taught that fireflies should NEVER drink soda. This sounds very cute! And I can see the potential for humor—which is great in a picture book. However, I think you need to clarify what attracted the hungry bullfrog—was it the soda or the hiccupping firefly. Though you want an editor curious about your book it’s more that you want them to read to find out how it happens, not really make them wonder what exactly you mean. I think if you don’t want to repeat soda twice you can go with something like I’ve suggested and tell us what attracted the bullfrog—was it a loud repeating noise (the hiccups?) or a strobe light (because he was flashing erratically)? Then it’ll be clear and still funny. Life is good for the insects at the campground—until something (what?) attracts a hungry bullfrog. When Herman, a feisty firefly, takes a sip (of sweet bubbly nectar) thehiccuping winged beacon learns why he’s been taught that fireflies should NEVER drink soda. Today's pitch comes to us from Pam B. Pam says, "Professionally I was a 3rd and 6th grade teacher before becoming an instructor in Early Childhood and Adolescent Education at Bloomsburg University. Currently I’m taking time away from teaching to focus on my family and my writing. You can follow me on Twitter @PamBrunskill." The Pitch: Based on a true story, FLOOD DOGS tells of a girl, her dogs, and the flood that comes between them. Cadence promises her dogs she’ll play fetch after school, then locks them in the mudroom on her way to the bus. When the local creek floods, Cadence and her family can’t get home, and her dogs are trapped inside. For three days, Cadence worries. Please send YOUR pitches for the coming weeks! For rules and where to submit, click on this link Would You Read It or on the Would You Read It tab in the bar above. There are openings in June, so you have time to polish your pitch for your chance to be read by editor Erin Molta! Pam is looking forward to your thoughts on her pitch! I am looking forward to getting wherever it is we're going without incident and to hopefully having a couple of enlightening revisits that will help the decision process! Oh the poor pups! But somehow, I have a feeling they make it :-) It sounds like a wonderful story and I would read it. The pitch reads very well, though it could be a tad more concise, and I am not sure about giving away the three days. Happy college revisiting! Tell Jo-Jilly she'd better behave! Princess Blue Kitty and jo-jilly back on another whirlwind adventure. Oh, can't wait to hear the results. My thoughts on today's WYRI is a Maybe. I'm attracted by the story being based on a true story. However, I'm not sure if the worrying is the angle to shoot for. Perhaps the actions taken to get to the dogs she loves may add to the pitch instead. Have fun on your trip, Susanna! Hope things go well! How surprising for me to see Pam's pitch here! (I've read her story!) Anyway, I love that first line, Pam. I think this pitch is a little long and maybe you could delete the 2nd sentence and go right into the problem. My vote for this week's submission is a Yes. It definitely peaks my interest in the story. I agree with Angela... I think it could be even stronger and tighter by replacing the worrying with some hint at the action taken to rescue them. Yes, I would read this. The fact that it is a true story (or based on one) I want to know what happened to the poor dogs. Does anyone know where they are and be able to rescue them? How flooded will the mudroom get before the dogs are rescued? Thanks so much, everyone! I was wondering if it was too long. I'll keep thinking! I like the suggestion about saying some actions instead of using "worries." worrying and waiting? The pitch suggests the third option. MAYBE. *I* would have to read it to console myself and to learn how it all works out, but based on this pitch I might pass for my kids. The image of the dogs "locked in the mudroom" feels like it might be too much for your target age group (their possible drowning feels too vivid). Could you soften that part? I'd prefer that the ending ask "how will Cadence rescue her dogs?" as that seems to be the mystery (as opposed to whether they survive, yikes!). Hope that this helps...sounds like a gripping tale and my interest is definitely piqued! Good luck with Princess Blue Kitty! Erin's comments are super. Did Stacy make that cake? wow! I love the pitch, but I also agree a bit with Victoria. It's a scary thing for a kid to think about in a different scary way to say zombies. It's more real for them and they might have a dog. I would just re-word it like Victoria said. As for Pam's pitch: I would read it - in fact, I know I have already read this story -in the news - I think there are a few like it. Otherwise, three days of waiting is.... really not exciting. Friends caught in Katrina went out in canoes to rescue pets.... Could Candy have a canoe? And even if she can't reach her pet, can she rescue someone else's? Can she volunteer with the animal shelter (which is trying to reconnect pets and owners) - while hoping that someone is doing same for her dog? Can she be a hero? I like Sue and Victoria's analysis of, and suggestions for, this story! I would read it, but, as Victoria said, probably only so I can find out what happened and how it got resolved, but the pitch will need to make it sound more exciting than it currently is. :) Good start though; I love stories based on true stories! I'm a maybe this week. Call me an overprotective mom, but I skipped the books that might be sad or scary. There's enough of that I can't shield them from in real life. If the pitch is rephrased to tell how Cadence saves her dogs, then it's a yes. I'm not sure I would read it yet...I have a lot of questions about the pitch. My first impression is that the book is about the worrying--the kid is worrying about her dogs. The flood seems like it happens quickly, then the child worries throughout the book, then we find out if the dogs survive. But is the ending only about whether or not they survive, or is there more to the story? And is the girl doing something other than worrying? I think this pitch would have me reading it if it told a little more about the story. I love the idea of a true story based on the floods, so I think you could hook me with a little more. Thank you so much so far, everybody. You've given me great ideas on how to improve my pitch. I have a good idea how I want to change it. In case you really want to know--Cadence's dogs survive, but her house does not. I would definitely read this story, Pam...I totally agree with the others that the pitch needs to be shorter...and the story would be more powerful if there was more emphasis on the action (going to find the dogs or helping other animals in danger while she waits to hear about her pets or the dogs themselves getting out and being heroes in some way). And yes, perhaps 'locking them in the mud room' is not the best image. But it's a wonderful story...and even better because it is a true one. I like the premise and agree with other's comments about amping the hook. :) Susanna, good luck with Jo-Jilly and the re-visits! We are still in the I have not decided stage. Instead of narrowing down her choices, my daughter is adding another program to the list (ack!). Thanks for the monkey cake--it helps!! Yes! to the pitch. I want to read the story and if you use suggestions in the comments below, your pitch will be strong. As usual, Erin's comments are very helpful to me as I think about pitching my stories!! Hope your travels were safe and productive, Susanna! 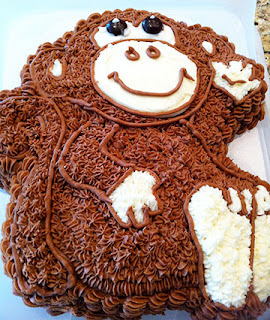 Love that monkey cake! Stacy...I just go bananas over your treats! Yes, I'd read this one, but I agree with others who suggested shortening it and making it sound more active. For example, I think it works just as well without the second line. Thank you so much! I already have a new working draft! Whew, what a day. I truly appreciate everyone's comments and advice. Being LATE again all the good comments have been used! That said, Yes I would read it. Love the premise but definitely feel that Candace have a very active part in the rescuing. I am late to the comments too. It is a Maybe for me, all the reasons have been mentioned previously, and with a bit of revision would definitely turn into a YES I WOULD read it for me. The premise of the story is quite exciting, making me wonder how she will rescue those poor puppies. I have never heard of a mudroom though, I'll have to look it up. Based on a true story, FLOOD DOGS tells of a girl, her dogs, and the flood that comes between them. Powerless to rescue her dogs until the water recedes, Cadence must acknowledge life's frailties and face her town's devastation. It is amidst this loss that Cadence reconnects with her dogs to experience joy and gratitude. Thanks so much for sharing your thoughts for Pam, Katie! Thanks so much for chiming in with your thoughts, Sue - I'm sure Pam will find them helpful! I know, Genevieve! It sounds scary and I worried about the dogs too as I read it! Thanks so much for your thoughtful comments, Mike. I think you have a good point! Thanks so much for your very thoughtful comments, Victoria - definitely food for thought. Princess Blue Kitty is a dependable friend. It's that Jo-Jilly I have to watch out for! :) Thanks for your helpful comments for Pam, Catherine - I think Pam will find them useful! Thanks so much for your very helpful thoughts for Pam, Sue - you make some excellent points that I'm sure she'll find useful! Thanks so much for chiming in for Pam, Wendy! Thanks so much for sharing your thoughts for Pam, Wendy. These are all important considerations! Oh my goodness Coleen! You and I must talk... over chocolate :) and compare notes! And thanks for your comments for Pam. I think we should have a party so we all get to meet in real life, and we'll let Stacy bring the chocolate cake :) Thanks for your comments for Pam and the good wishes, Penny! Thanks Susanna, I live in the tropics, no need for a mudroom ;-) Before that I lived in Amsterdam where we don't have room for a mudroom, I think we may call it a hallway instead.